Tashia Dzikowski completed her BSc at the University of Manitoba in May 2004 and her MSc at the University of British Columbia in November 2006. She is currently a PhD student at the University of British Columbia studying the origin of carbonate-hosted gem corundum occurrences in Canada under the supervision of Prof. Lee Groat and Prof. Greg Dipple. 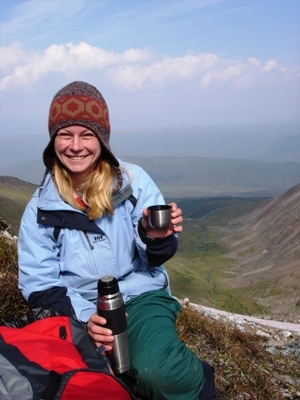 Her main focus is on the Revelstoke ruby and pink sapphire occurrence, but she is also working on the Kimmirut sapphire occurrence on Baffin Island. I am studying the origin of the marble-hosted Revelstoke ruby and sapphire occurrence. I plan to determine the following through field work and laboratory analysis of samples: the nature of the protolith, the role of marble in corundum mineralization, concentration mechanisms for aluminum and chromophores, conditions of formation, and the influence of local and regional geology on mineralization.